The objective of the research was to develop a generalized height–diameter model for Quercus suber L. in Portugal, which can be applied both to undebarked and debarked trees, with diameter at breast height over cork larger than 2.5 cm. A nonlinear fixed effects model (NLFEM) and a nonlinear mixed effects model (NLMEM) approaches were used. Parameters estimates were obtained using the SAS macro NLINMIX, which uses a linear approximation to the marginal likelihood function by expanding it with a first-order Taylor series on the random effects. The option of expanding on the random effects at their current empirical best linear unbiased predictors (EBLUP) was used. 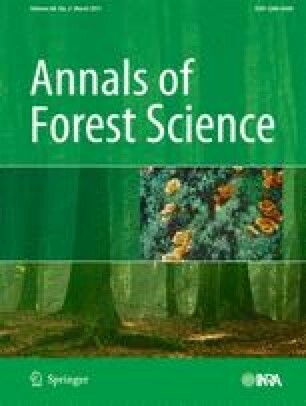 The fitted models were evaluated using an independent data set, together with an existing model specific for undebarked trees. To obtain subject specific predictions with the NLMEM, a conventional and an improved calibration procedures were applied, considering four different tree sub-sampling designs. Both proposed models included dominant height and stand density as covariates to explain plot variability. Validation indicated that, even in the situations where the NLMEM calibration is not possible, this model should be preferred. The differences between the validated models, which were more evident for young stands, were considered. No large differences in predictive accuracy were found between the calibrated NLMEM using the conventional or the improved calibration procedures, for all the considered sub-sampling designs. Financial support was provided by project CarbWoodCork (POCI/AGR/57279/2004 and PPCDT/AGR/57279/2004) financed by the Fundação para a Ciência e Tecnologia (Portugal) and by project Motive (Grant Agreement 226544) financed by the European Commission under the Seventh Framework Program for Research and Technological Development. This paper is part of the PhD project of the first author, which is funded by a scholarship (SFRH/BD/23855/2005) granted by Fundação para a Ciência e Tecnologia (Portugal).